Weighted blankets help soothe those who have trouble sleeping, including children with special needs. These blankets can be quite expensive, but you can make your own with snuggly fabric and a weighted filler. The weight of these blankets feels like a firm hug, which can be comforting, and that bit of pressure acts as a sleep aid. Occupational therapists often recommend them for kids with a sensory-processing disorder, but adults with insomnia use them too. 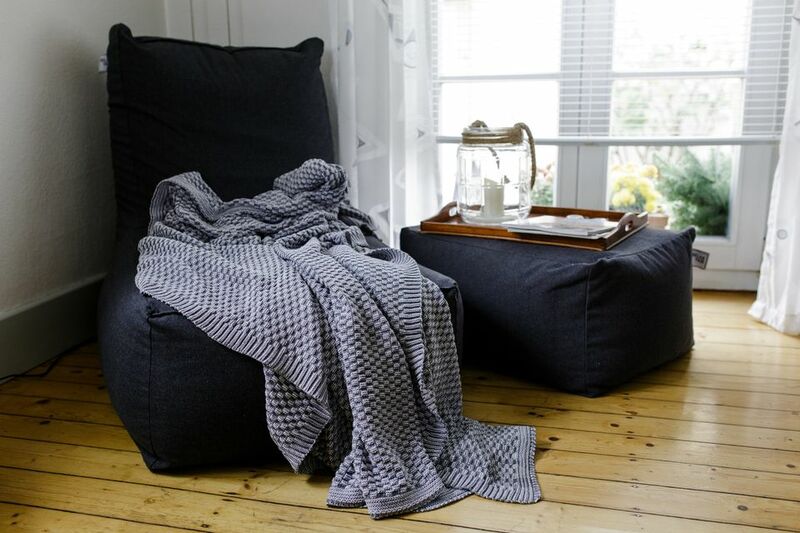 While the sewing itself is only simple straight lines, this project is best suited for intermediate sewers, as the weight of the blanket requires special attention. Note: This method for making a weighted blanket uses small, weighted, stuffing beads, recommended for children more than 3 years old. Even if you're making this for an adult, check the seams regularly to avoid any beads escaping. Decide what approximate size you want the blanket to be. 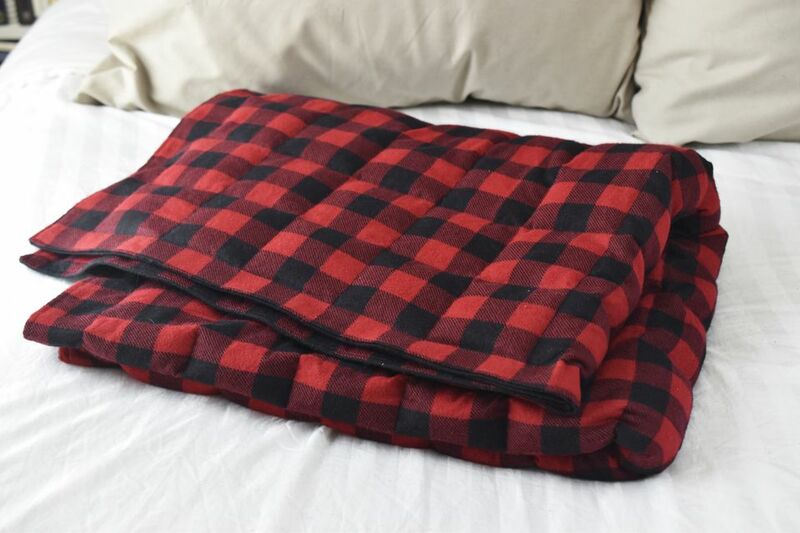 A weighted blanket doesn't need to be as large as a quilt or comforter. It just needs to cover the person who will use it. Next, determine what size you want the squares filled with weighted stuffing to be. They can be anywhere from 3 to 5 inches. The cut measurements should be a multiple of the size of the squares, plus 4 inches. For example, the blanket in the photos is 37" wide (3 x 11 = 33 + 4) by 61" high (3 x 19 = 57 + 4). In general, weighted blankets should be about 10% of a person's body weight, though sometimes they can be even more. If you're making a weighted blanket for a child with special needs, you should always check with an occupational therapist for help in determining the best weight. Even for an adult, when in doubt, ask an occupational therapist. When you know what the total weight needs to be, multiply that out into ounces and then subtract the weight of the fabric. Divide the result by the number of squares in the blanket. This is how much weight goes in each square. Use a kitchen scale to figure out the volume of weighted pellets needed in each square. Usually, one ounce is a little less than 1/4 cup. The blanket in the photos has 209 squares with about 1 ounce in each square. Note: It's very important to use plastic filler beads for this project so that the blanket is washable. Mark 2 inches in from each side. Mark the grid of squares based on the square size you chose. In the example blanket, the checked fabric served as the markings. Sew the front and back pieces with right sides together and a 3/8" seam allowance. Sew the two long sides and one short side. Leave the top open. Turn the blanket right side out and open the seams. Starting and ending a short distance from the open side, topstitch 1/4" from the edge. Starting 2 inches from the open side, sew along the marked lines that were 2 inches from the fabric edge. Sew along the two long sides and the bottom. Backstitch at the beginning and end. This inner topstitching will contain the grid of weighted squares. Next, sew all the vertical channels on the marked lines. Starting at the closed bottom edge, begin your stitching just over the line of stitching that's almost 2 inches from the inner topstitching. End the stitching just over the top 2-inch marking, and be sure to backstitch at the beginning and end. When sewing these lines, it's helpful to start at the center and then sew the next lines near the center of those two sections, and so on. Working on the lines this way prevents the sewing from getting off track and the fabric bunching. Place a scoop of weighted stuffing beads in each vertical channel. Remember that the scoop should hold the correct weight based on the weight planning. Shake the beads down to the bottom of the blanket. Depending on the fabric, some beads may stick in the channels (flannel tends to stick a lot), but don't worry about that too much. Push the filler down into the bottom of the blanket. Feel for any stray beads and work them down too. Use pins to form a line of basting that helps keep the stuffing beads in place and away from the marked line. You don't want to accidentally sew over one of the beads, as it might break your needle. Sew a horizontal line on the marked line. Begin the stitching just over the line of stitching that's almost 2 inches from the inner topstitching. End your stitching just over the inner topstitching on the other side, and be sure to backstitch at the beginning and end. As you sew, support the weight of the blanket so it doesn't pull as you sew. Feel along the marked line as you go and push any stray beads out of the way. If you meet any resistance when sewing, chances are a bead got in the way. Pause and work the bead out from under the presser foot before continuing. Repeat the process of adding filler to each vertical channel and then sewing horizontally to close off the row of filled squares. When you reach the top of the blanket, sew the last row of squares closed. This stitching should meet up with the line of inner topstitching, overlapping a tiny bit. Fold the edges of the open side in about 1/2". Starting and ending where the topstitching ended on the sides, topstitch 1/4" from the edge. Note: Normally all topstitching would happen at the end of the project. Because this project gets quite heavy, it's much easier to do most of the topstitching before adding the filler, then finish off only the top at the end. Instead of marking squares on a large piece of fabric for the blanket front, you can sew squares to make a patchwork weighted blanket, then sew the channels and rows along the seams. Sew with a small stitch length to keep the weighted stuffing beads in place. Use a strong, thick needle, such as one designed for sewing denim, to reduce the chance of your needle breaking. Avoid pulling or pushing the blanket while sewing the rows. Support the weight and let the feed dogs do the work. If possible, push your sewing machine in from the edge of your sewing table. Having extra table space helps support the weight of the blanket as you sew. Above all, sew safely. Pay attention to the location of the basting pins, watch out for breaking needles, and keep your fingers out of the way!